Despite his hearty HOHOHO & promises of treats & toys to be left under the tree, many a child can be found desperately trying to escape the lap of the bearded jolly old Saint Nick all decked out in his red suit & jingling bells! And so when the big man himself offered to take time out of his busy schedule to drop by our home for a personal visit with our wee little LAM this past weekend, we welcomed the opportunity for her to meet him for the very first time. 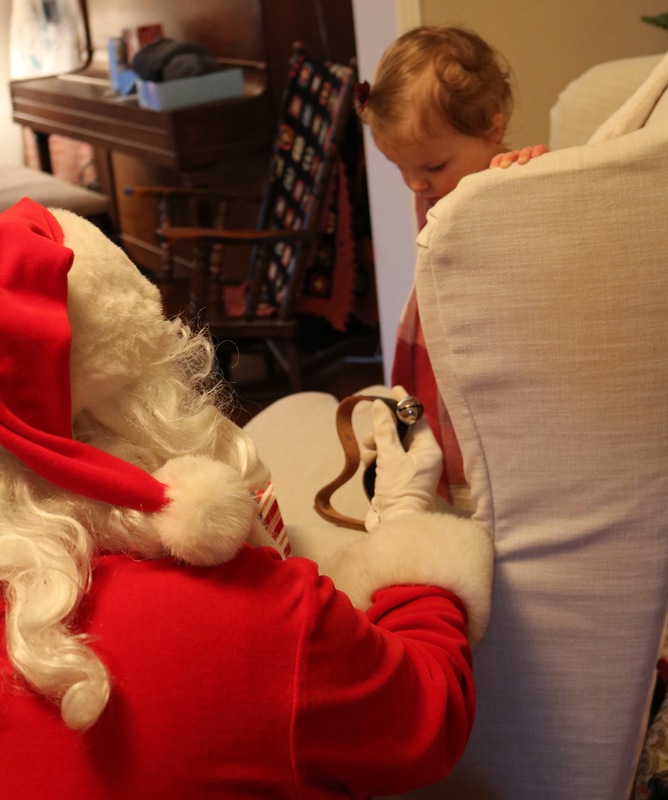 Our neighbour & friend, who happens to have a very close & personal connection with the man in the red suit, came through our front door & headed upstairs to work his magic in calling Saint Nick to appear. 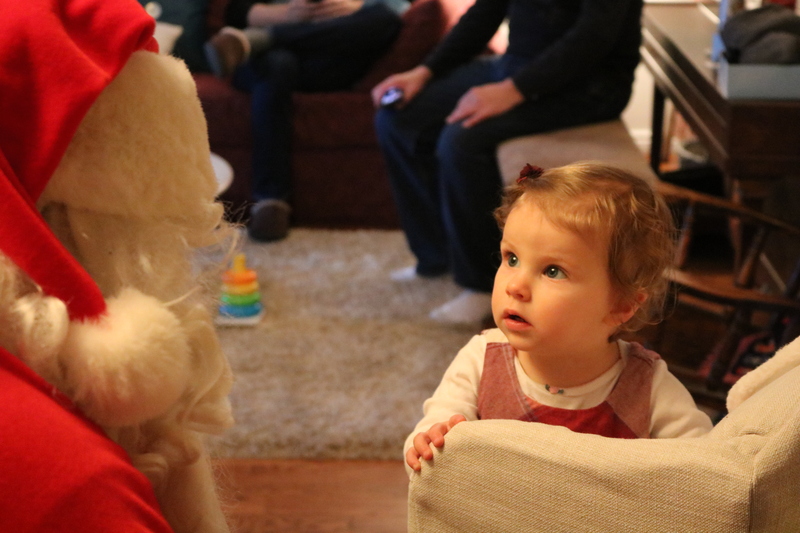 As LAM heard the jingling of bells coming down the stairs, she stood mesmerized as Santa appeared. To see the wonder in the eyes of a young child is like being gifted a little bit of magic. Who is that man in the red suit coming down the stairs? So as not to overwhelm LAM, Santa crouched down & quietly introduced himself as she stood checking him out. He even offered up his jingle bells to play with. Perhaps if you rang my jingle bells, I would appear a little less intimidating. Feeling slightly resistant LAM did her best to sit in his lap & put a smile on her face. Hurry up & take a picture! Before long, she decided she had sat in his lap long enough & planned her escape route. 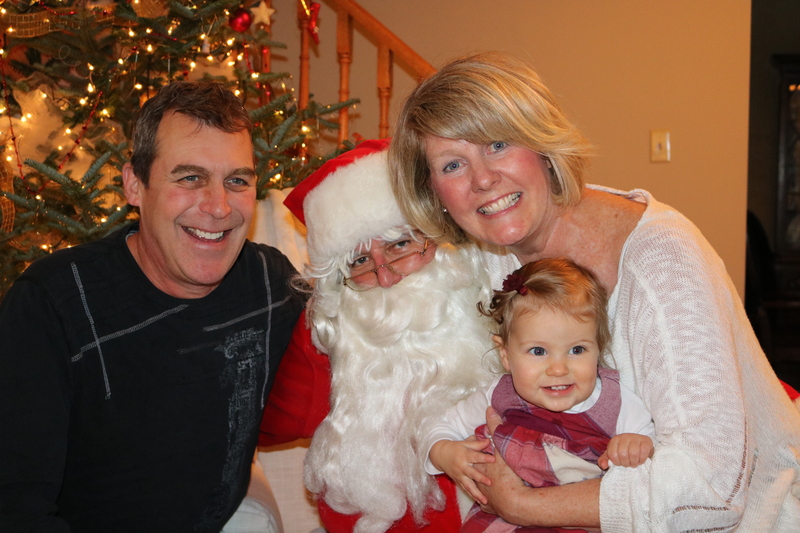 Once on the floor, she determined Santa was much less scary with Mom & Dad by her side. It’s funny how Santa can bring out the child in all of us, inviting children of all ages to sit a moment & recall a time we dreamed of he & his team of reindeer magically flying through the night to deliver a thing or two from our wish list. 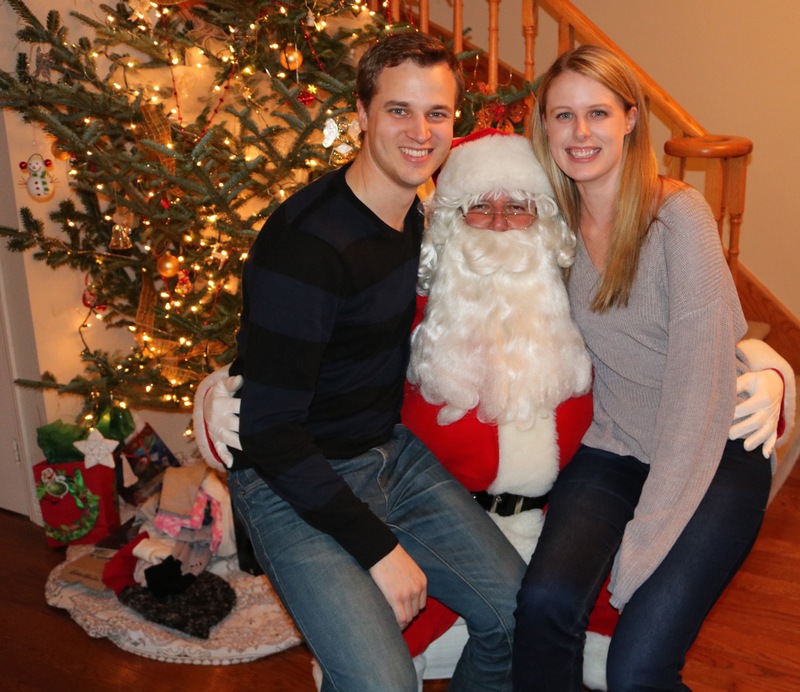 Santa brings smiling faces to adult children too! I think Santa may have been tickling me! Thank you to our dear friend aka Santa, for not only taking the time out of your very busy schedule to stop in to meet our little LAM, but for all of the children over the years you have gently & wholeheartedly embraced. Hoping you & yours find a little magic in the season with the ones you love. This entry was posted in Uncategorized and tagged Christmas, Family, Grandparents. Bookmark the permalink. Sooo cute! I love the look in her eyes when she is first checking him out. I’m afraid that I would have been less brave at her age. Merry Christmas to you and your beautiful family! It was so fun watching her Janis. Although a wee bit cautious, she fared very well! Merry Christmas to you & your loved ones! I know you can relate Karen. This little person absolutely melts my heart! Thank you so much for continuing to read & to comment, I have been rather absent for a number of months when it comes to writing. So sweet! Love the look on her face when she first saw him. 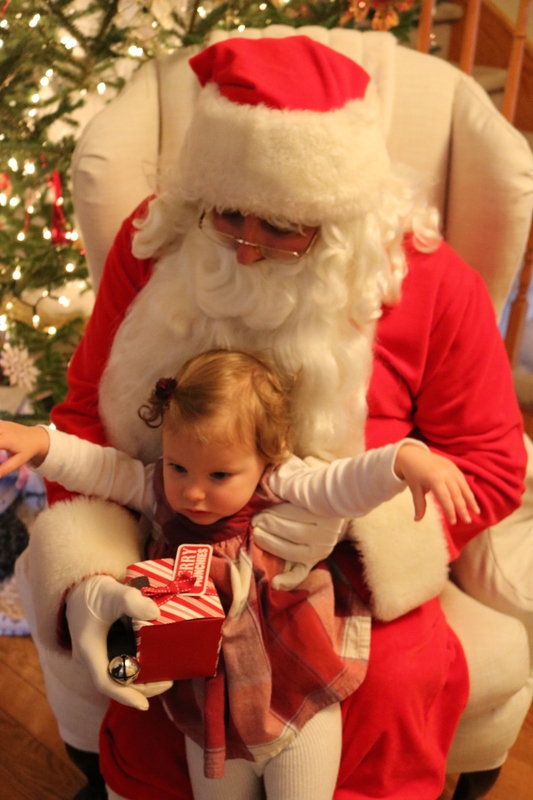 My youngest granddaughter (not quite 2 last Christmas) was not very keen on sitting on Santa’s knee at all. This year she is very excited about going to see him. Have a good one Lynn with your lovely family, and I wish you a very happy 2018. Lovely post, Lynn. Thank you. LAM is the cutest. Thank you John! She is an absolute joy! Thanks for sharing those precious photos. That was such a gentle way in which she was introduced to Santa Claus. Her mother at that age and older would have had a look of horror on her face and would not let him get within 20 feet of her. Brave Lucy! Santa Jimbo was so wonderful with her❤️ I am chuckling thinking of the countless children who react the same way Mary would of! All things considered, I agree, so grave! Wow. You know Santa personally! Please tell him that my name being on the naughty list is purely from a clerical glitch. And Merry Christmas. Hahahaha! I will be sure to pass that along Al! 😉 Merry Christmas! Lynn, this is so beautiful! Your family is gorgeous and the feelings in this post are so warm and happy! Thank you for these wishes! Merry Christmas! Lynn, thank you for your very kind words. Wishing you & yours a peaceful holiday filled with nothing but joy. You deserve it! Thanks so much! Merry Christmas to you and yours! I loved your post!! Thank you! She is a precious gift to our lives, that is for sure! Each photo is a wonderful keepsake, Lynn. 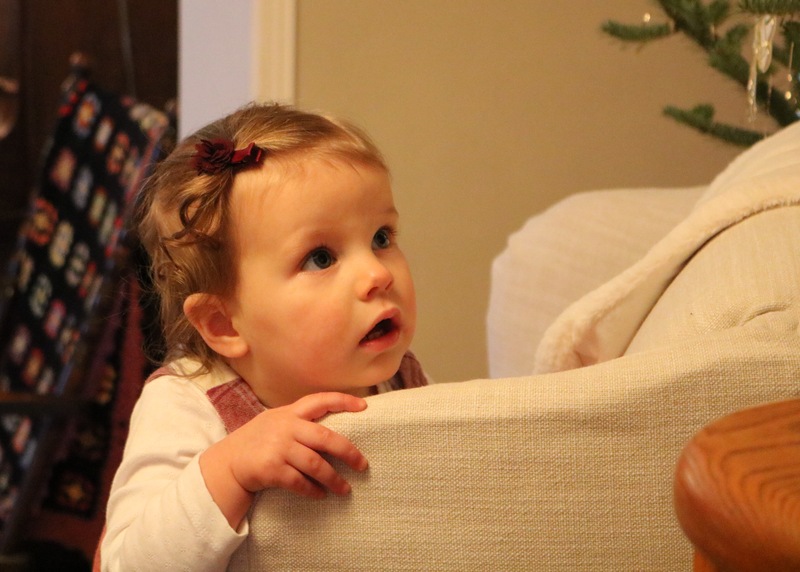 Your little grand-daughter is absolutely adorable ❤️ … but then again, you already knew that! Merry Christmas and best wishes to you and your family! It is hard sometimes to capture those little moments as she is on the move! The look on her face when she saw Santa was so priceless Joanne❤️ Wishing you & your gang a very Merry Christmas! Santa’s a really great guy, isn’t he? He is the best Scott! Merry Christmas to you & your fam! Now that’s the perfect visit from Santa! Oh my goodness Lynn she is absolutely adorable. What a gift for Santa to come round for a personal visit. So much less intimidating for wee ones. 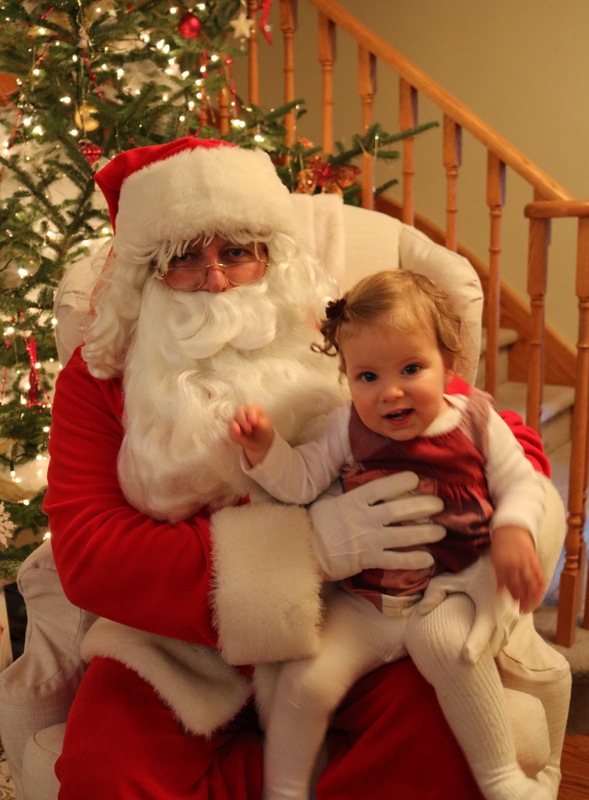 Our granddaughter followed in her Mom’s tradition of screaming bloody murder on Santa’s lap. Was happy standign beside him and perfectly fine once removed from his lap but oh my it did make quite the photo. Wishing you and your family a joyous Christmas. Sue, those photos are the best! We were so fortunate that Santa was available & willing to pop by. We may have traded off for a rye & ginger! Our wee girl brings us such joy but I suspect you already know that! 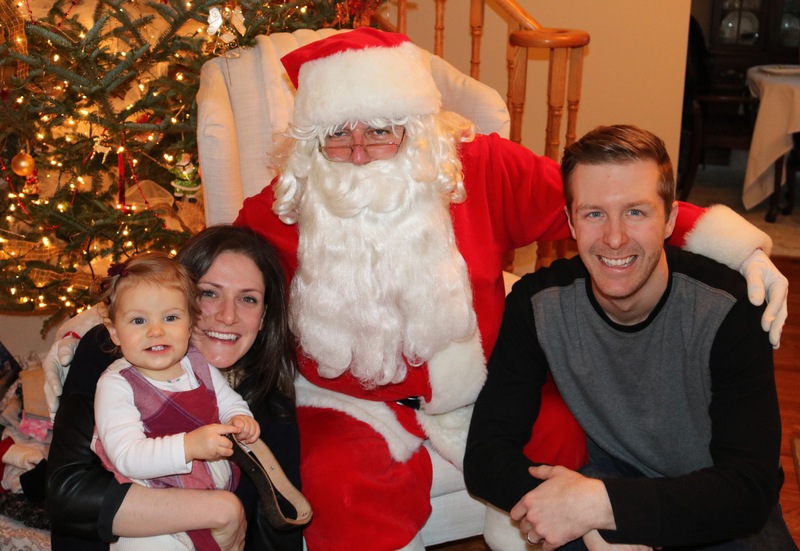 Wishing you, Dave & the rest of your family a wonderful Christmas! What a wonderful joyous post. I just loved the photos ~ too precious! Thanks for sharing and happy holidays to you and your family. Happy New Year, Lynn. The photos are wonderful, especially that first one! Adorable! What a treat for all of you. Hope you had a wonderful holiday season and are gearing up for a happy 2018. Thanks Laurie! She brings such joy to my heart! No problem Jo! It is a busy time of year & I must confess, I have found myself missing some posts as well! Christmas truly is a magical time of year! What a beautiful family! She is growing so fast Louise! 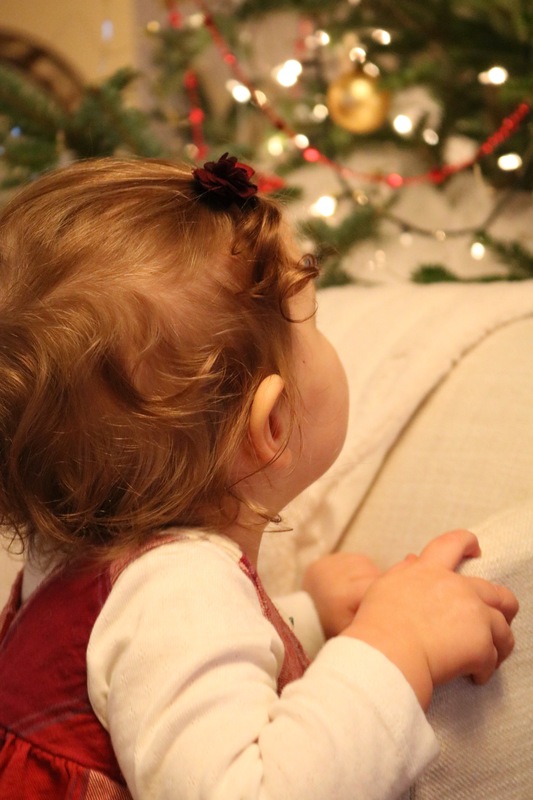 It was so much fun watching her reaction to seeing Santa in person! Thank you Jane! It was precious, that’s for sure!